Lost, found and a happy ending. - Never attribute to malice that which can be adequately explained by stupidity. I was driving to the doctor this afternoon and just near the top of my road I spotted a ferret heading into the road. I stopped and he ran under the car. I got out and tried calling him. He came right up to me and let me pick him up. "Oh bugger!" I thought "now what?". Popped him on the passenger seat and drove home. Needless to say the ferret didn't stay on the seat, he scuttled all over the place, the only time he bit me was when I decided I didn't want him down my Tshirt while I was driving. He decided my speaker didn't need a cover, but that's an easy fix. Anyway I got him home and needed to quickly get him in a cage, myself cleaned up and back on the road to the doctor. Jo found the cat basket and we wrestled the ferret into it. He was soaking wet from the rain but obviously well fed and looked fit and healthy. Someone was going to be missing this little chap. At this point I remembered I had been on my way to the docs, so left Jo ferret wrangling and headed off to try and keep my appointment. I just got to the docs in time.at this point I noticed an odd smell. Ah it was me, the great smell of ferret. One of my fellow patients in the waiting room also noticed it, remarking to her friend "oh what's that smell?". I resisted the urge to put on my best Joe Grundy voice and say "That's me ferret Mrs. Yer wanna take a look?". After I got back from the docs, I went for a wander around the area I found the ferret in the hope of finding a "Lost Ferret" poster on a lamppost. No such luck. I also trawled a few lost pet Websites, and popped into the local vets to check their lost and found book. Again no dice. But as he was so healthy and well looked after I figured he hadn't been on the run for more than a day or two and it could be a little early for a "Where's my ferret?" poster. In the mean time Jo asked Jem if he knew anyone in the area who kept ferrets. Jem posted a heads up on facebook, a long-shot but I figured Jem knows enough people in the area that the rule of seven degrees of separation may work to Mr Ferret's advantage. In the end it wasn't seven degrees of separation, it was one. 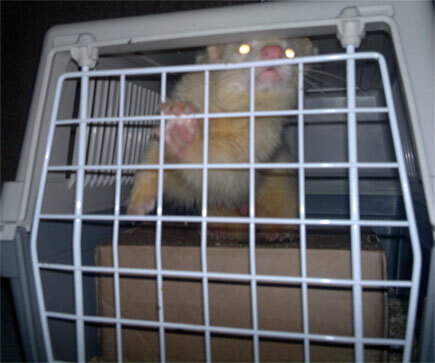 The owner saw his post (yes it was friend of Jem's who and lost the ferret) so we were able to returned Freddy (for that's his name) to his home. Really made my day to be able to return him to very happy and relieved owners. I was pretty relieved too. I know what it's like to have an animal go missing. Freddy about to go home. what a lovely story - with a good happy ending! Thanks. He's one lucky ferret. It's been pointed out to me that some people wouldn't have been at all comfortable with picking up a ferret in the street. He's quite a character and even though I was swearing that if I didn't find the owner there was no way I was keeping him... I know he would have ended up being another lodger here. I've never had to go out and actively get animals, they just turn up. It was like Fred's 1991 self had come back. Prince kept him under close observation. Maybe it is Fred... A case for Dirk Gently I think.